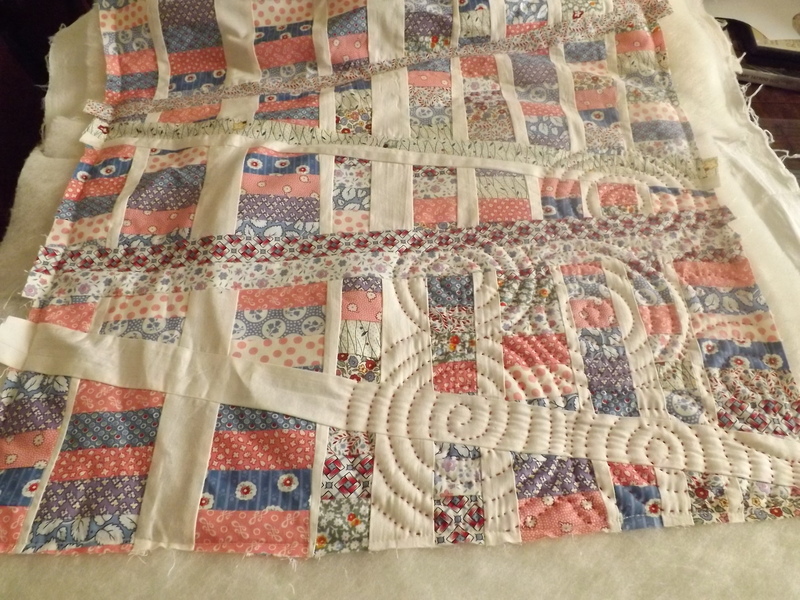 I told myself I wouldn’t do this until I finished another quilt first, but its so small….it wont take long….I can do it quickly….its a good way to use up scraps….I didn’t have to buy anything new….I have a piece of wool batting that is big enough. OK enough justification, I just wanted to do it. 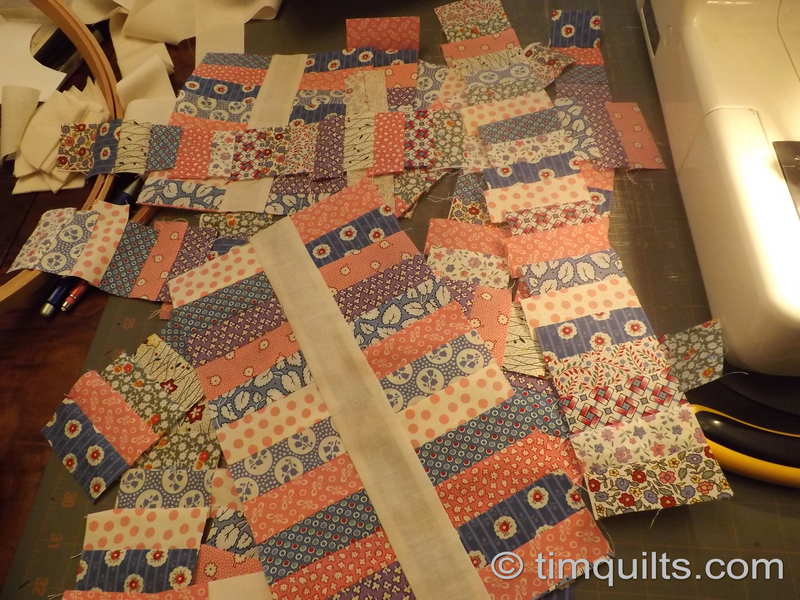 and I guess I can look at this little quilt as a warm up for quilting the big one. I made a sandwich with muslin backing and wool batting and I put in a few pins and then sewed the layers together and took out the pins. I was going to mark the top before I started quilting but then I decided to just go for it and be more free form. I am using #8 perle cotton thread and a big #5 embroidery needle and making big stitches. I am making spiraling circles and so far I think I like it. 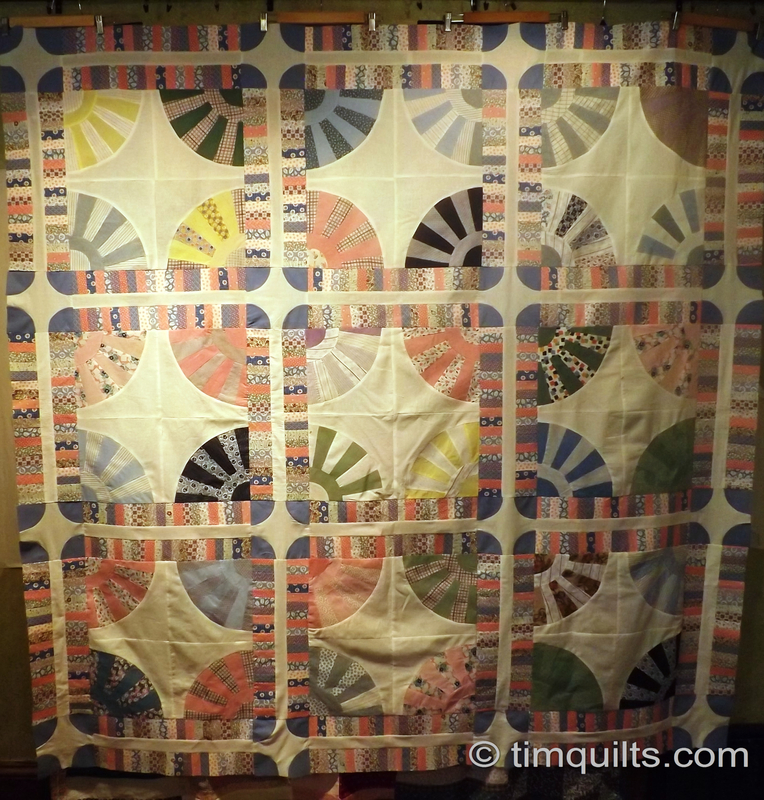 This entry was posted in Quilts and tagged big stitch quilting, hand quilting, Quilts. I love this! I can’t wait to see it finished. thanks!…this is very different from what I usually do and I think that is what makes it fun! Love the spirals- great idea. 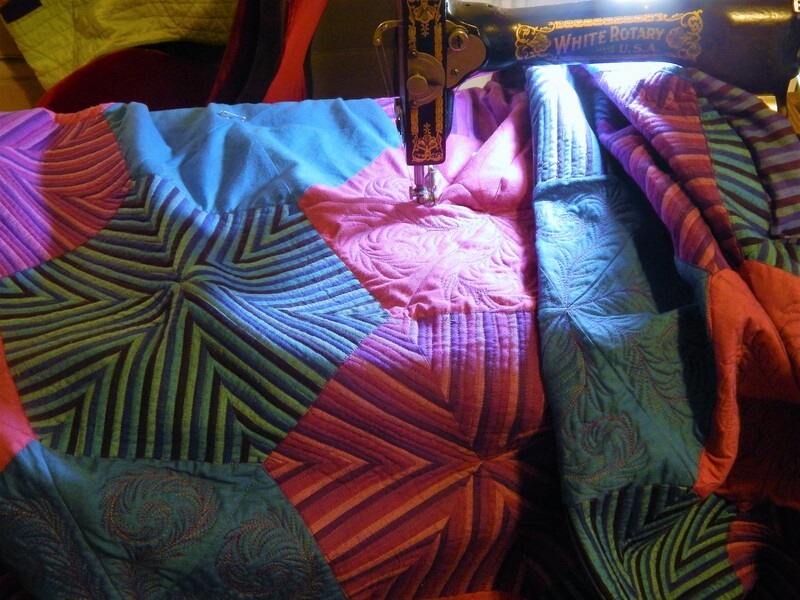 i absolutely love what this does to the quilt, pure genius but i am curious about your plaid orange peel? Love the circles! Wished I lived closer to you as I’d babysit Teddy when you went out of town. He’s so sweet. This is SWEET STITCHING! I love it. Would not have thought of the spiral stitching my self. I love the contrast of the circles on the rectangles and bars. Gives a lot of movement and texture! I’m going to Lancaster on Friday! I can’t wait to see your quilt there and maybe I will see you! Those circles look very fun! Great contrast. LOVE!~ I am going to have to buy some perle cotton thread. I don’t have any… I really enjoy seeing how you quilt things because I love to hand quilt, but don’t have the imagination for what to do, pattern wise. Love it! Wow that is something. You can absolutely turn anything into wonderful stuff! 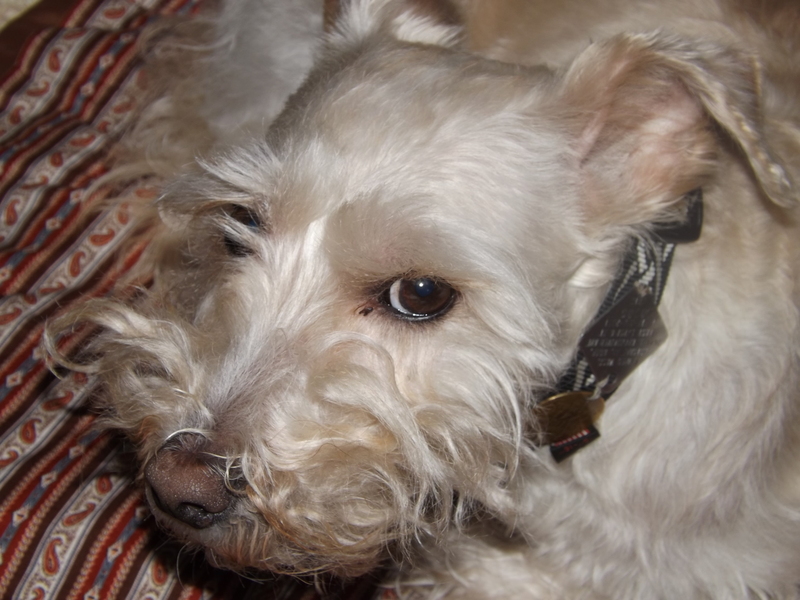 And Teddy has great bed face expressions! Love it, and the look Teddy has on his face! 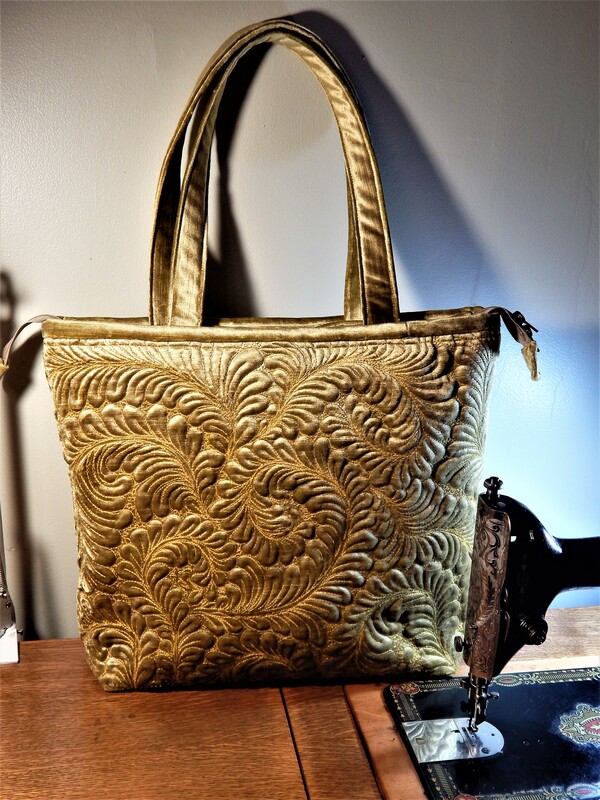 thank you!….the beautiful applique you do inspires me!…some day I will have to make myself practice! 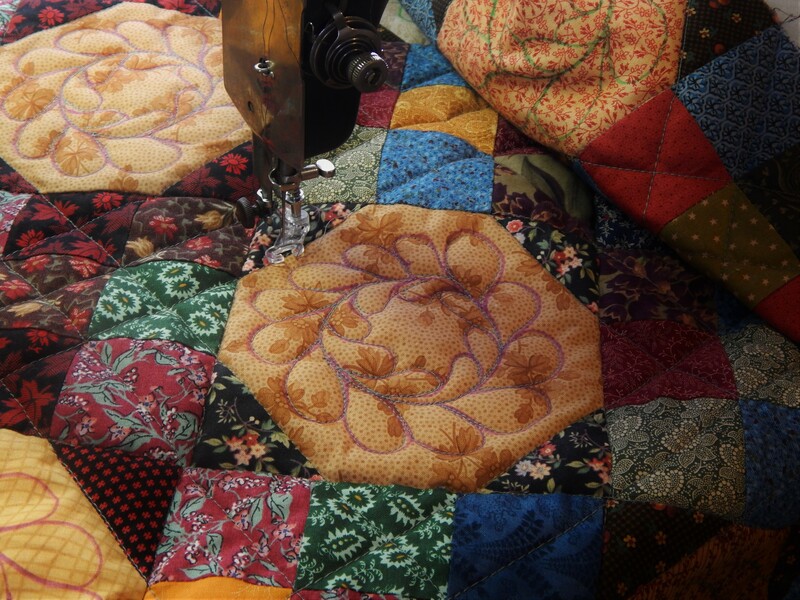 I love the effect the circular quilting is adding, makes me think of ripples on a pond. Fabulous! Oooh! The circles make it so very intersting! Most unexpected! Love it, Tim. It’s so textural, I just want to reach out and touch it! Thanks!….It is fun to run your hand over…. Tim those spirals are just a bit fabulous 🙂 love them. You have such an eye for design, I really enjoy seeing what you will come up next. When I got to the bottom of the post, I had to laugh. 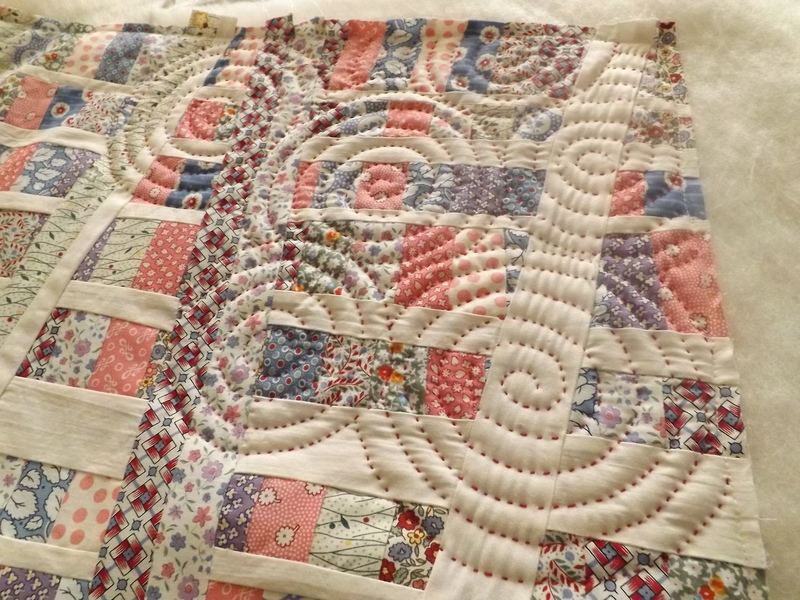 You are the White Tornado of quilting !!! That little piece you have left is just right for a blankie for Teddie. Every good dog should have his own quilt ! The circles are very cool, Tim — a counterintuitive and/but very prime choice. 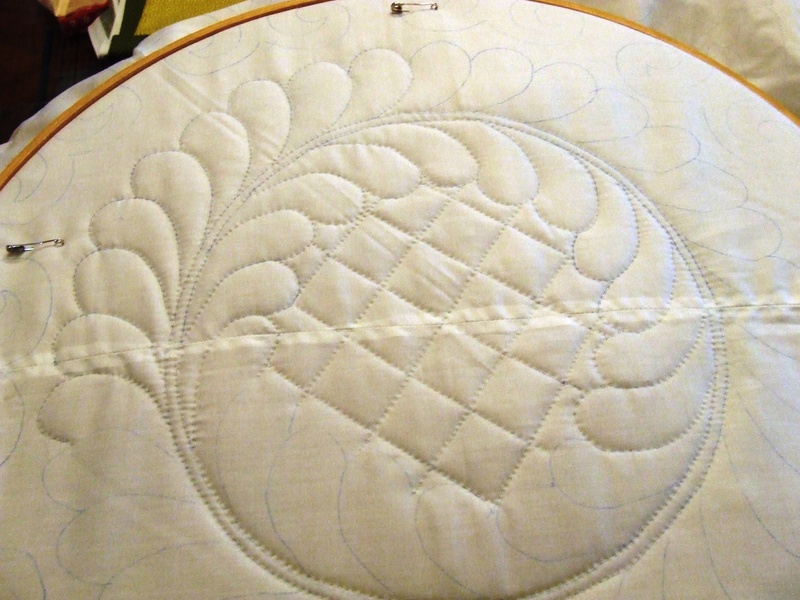 Love the big stitch circles! 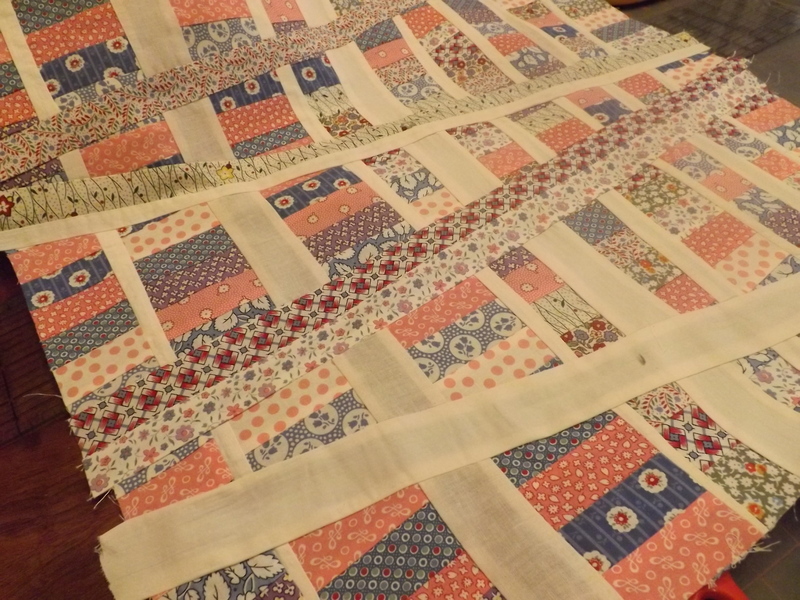 I’ve been sitting on the fence as to whether or not to big stitch a log cabin quilt. Your post just made my decision for me! I’m going to try to big stitch hand quilt it. 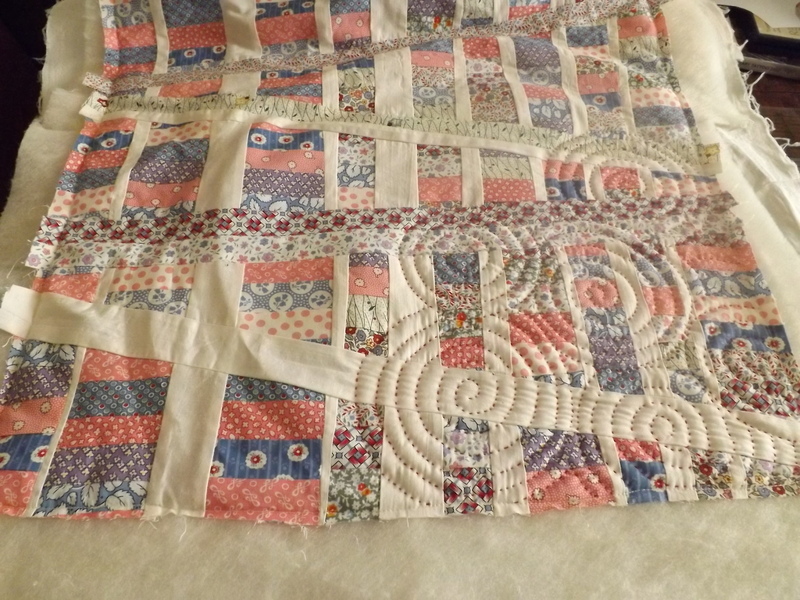 My first hand quilting larger than a wall hanging. You are an inspiration! Keep up the great posts! I really love the big stitch circles!! Look forward to seeing it finished! Love your work. 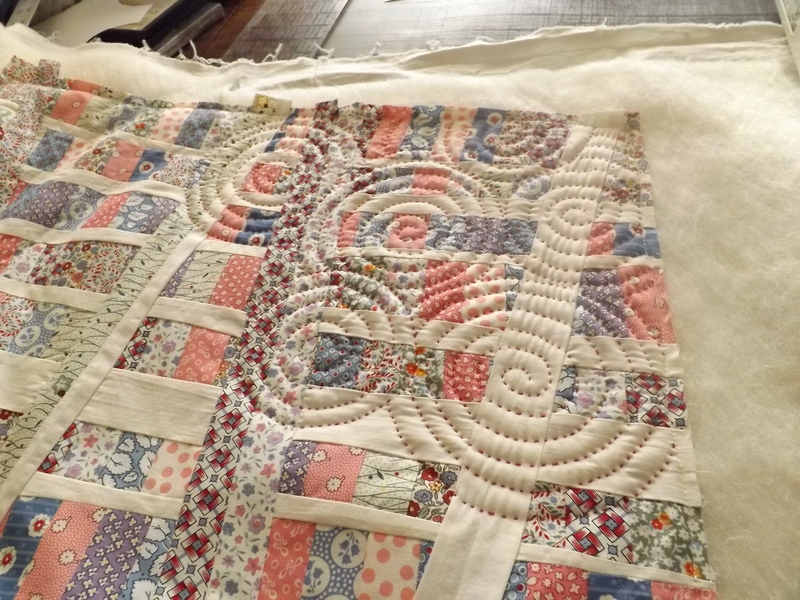 Love the big stitch quilting. Hope you have more big stitch projects in the future. I sure will….I am really beginning to love it! I like this. I like circles or ovals on squares or blocks. Teddy is so cute and bright eyed. And big thread and big stitch are my favorites.